Once you've gotten the technique for preparing a golden-brown, crispy-skinned roasted turkey down pat, it might seem scary or even foolish to fix what's not broken. Unless time is an issue that is. If you're lucky enough to own a convection oven, you can roast that same turkey in a fraction of the time. Turkey cooked in a convection oven should be roasted at 325 F. If using a dark roasting pan or oven-roasting bag, reduce the heat to 300 F. The following general roasting times and temperatures are suggested for various-sized stuffed and unstuffed whole turkeys, breasts, and dark meat. You might read that proper internal temperatures should be 180 F for thigh meat, 170 F for breast meat and 165 F for stuffing. However, things have changed. 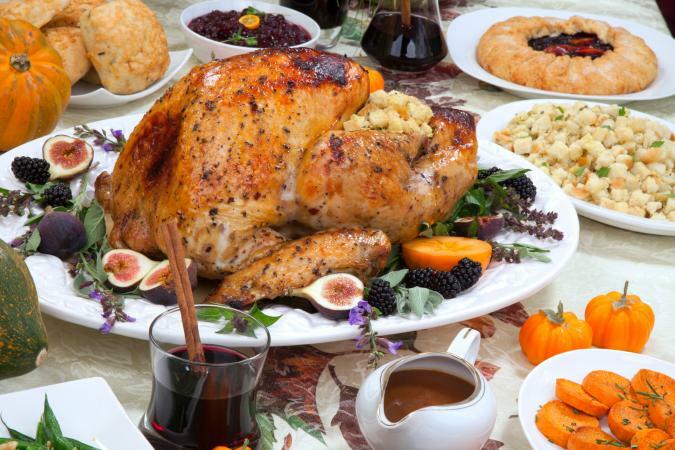 According to The National Turkey Federation, no matter what the weight, the internal temperature of the turkey when an instant-read thermometer is inserted between the thigh and side of the breast without touching bone should now be 165 to 170 F. This remains true for the stuffing as well. Use the following guidelines to roast a whole stuffed turkey. The following roasting times are for unstuffed turkey. A thermometer inserted into the thickest part of the breast without touching bone should register 165 F, according to the USDA. The USDA also advises roasting a stuffed whole turkey breast following the times indicated below by weight or until an instant-read thermometer inserted into the thickest part of the breast meat registers 165 F.
If you've decided to leave the breast unstuffed, here are the roasting times. The internal temperature should be 165 F.
Place in pan and cover. Bake 1 to 1 1/2 hours depending on size. Uncover and bake another 30 minutes or until the bone moves easily and the temperature on an instant-read thermometer not touching bone registers 165 F.
Convection cooking, whether it's an entire turkey or one boneless, skinless chicken breast, involves some adjustment in time and temperature because food cooks 25% faster than a conventional oven. While the basic roasting time estimates are good, and you should always go by the temperature reading for safety, the answers to these questions can provide additional instruction for properly timing your turkey while cooking. What size is the turkey? The larger the turkey, the longer it will need to be cooked. Are you cooking a whole turkey, a turkey breast or just legs and thighs? White meat cooks more quickly than dark meat, so if you are cooking a breast only, it will take less time to cook the meat to a safe temperature. Is the turkey stuffed? Stuffed turkeys take longer to cook to bring the stuffing up to a safe serving temperature (165 F) and avoid food poisoning. How dark is your roasting pan? A darker roasting pan will generally cook food more quickly than a shiny metal pan. Will you be cooking the turkey in a bag? 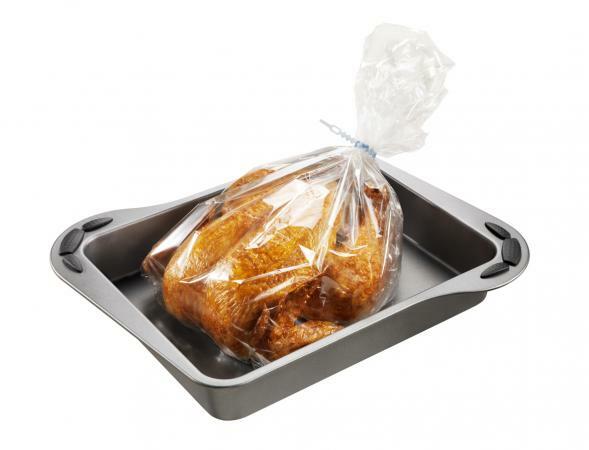 Cooking turkey in a poultry bag further reduces the cooking time. Check the bag manufacturer's instructions for specific cooking times. How often will you be basting the turkey? Every time you open the oven to baste the turkey, the temperature of the oven drops slightly. If you baste often, this can lead to slightly longer cooking times. Use a turkey thermometer to assure the turkey has been cooked to the right temperature. Make your next turkey your best turkey with these tips. Start with a fully thawed turkey. If you wish, season the turkey the day before with a dry rub for added flavor. Let the turkey come to room temperature or at least let it sit out of the refrigerator for a few hours before cooking. The heated air of a convection oven needs to penetrate the thickest parts of a turkey so don't truss it closed and let the wings fly free. Instead, insert a long skewer between the drumsticks to keep the turkey from toppling over. Make sure the roasting pan is shallow and place the turkey on a rack so the heated air can easily circulate around the bird. Remove the turkey from the oven when it reaches about 160 F only if it is unstuffed (stuffing needs to reach 165 F) and allow it to stand for about 20 minutes tented with foil. The turkey will continue to cook bringing it up to the safe temperature of 165 F. This is called carryover cooking. This standing time results in a juicier turkey. Cooking a turkey in a convection oven is a terrific way to prepare your next holiday bird. By following the guidelines above and carefully monitoring the temperature of your turkey, you'll have a tasty, juicy turkey that cooks more quickly than you ever could have imagined. And if you have a combination convection steam oven, the times are mind-blowingly fast.